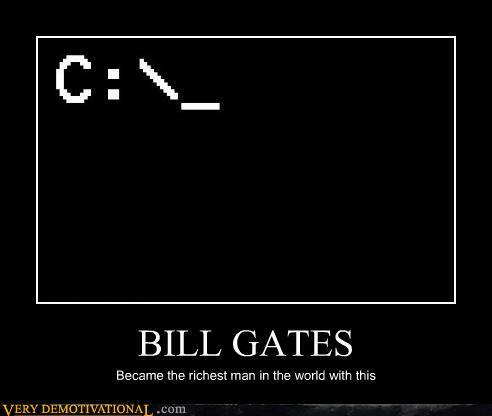 The mind of Bill Gates in a nutshell. In short, he is pushing for agricultural methods that would destroy Africa in the long run while providing Monsato, with whom he has partnered, with even more profits. He does this despite the scientific evidence that indigenous and time-tested ways of farming would be more sustainable. There are many reasons why parts of Africa are stricken with famine. The legacy of European colonialism comes to mind. Not only have westerners ravaged Africa’s resources for hundreds of years, they drew the arbitrary borders that forced ethnic groups into fake, inorganic countries, resulting in competition between these groups for political power and control of resource-rich lands. This is part of what the genocide in Darfur is all about. Plus, the Sahara Desert is expanding. This forces people onto more desirable lands, leading to over-cultivation of those lands, leading to even more desertification. It is a self-perpetuating cycle. So Africa certainly is in need of more sustainable farming, among other things. The Bill Gates and Monsato way is not the answer. I can’t help but notice the similarity between Gates pushing for this and his push for education reform in the United States. He takes a complex issue like education or famine and proffers simplistic solutions. For an educational “achievement gap” caused by structural problems in the entire socioeconomic system, his solution is to open up charter schools that accept “no excuses” from students and subject them to an endless battery of standardized exams. For a famine that has been caused by both historical and environmental factors, his solution is to shove Monsato seeds down everyone’s throats (almost literally). This is not a smart man. Both of these things reflect a very one-dimensional way of thinking that fails to appreciate the complexity of the problem at hand. The article hit it on the head by referring to Gates as “technocratic”. And this technocrat has all the money in the world to foist his schemes on the rest of us. He does this through his “philanthropic” Gates foundation. The common link here is privatization of a public resource or commons, whether its public education or the agricultural gene pool, with non-profit institutions as an opening front or wedge for the privateers who will follow. Bill Gates is like a lumbering muscleman in a two-bit street gang. He has tons of brawn (money) but his utter stupidity makes him easy prey to the other members of the gang (Pearson, Monsato) who whisper in his ear to go beat up some unsuspecting victim (our education system, Africa’s food supply). Once the victim is beaten to a bloody pulp, the gang comes over to rifle through his pockets (privatization). Gates is a tool, but he is not an unwitting one. Much like the muscleman mindlessly shares the values of criminality with the gang, Gates mindlessly shares the values of markets with the privatizers. Schools stand to see whatever vestiges of free-thinking and enlightenment they have left crushed under the inexorable march of Gates’ corporate agenda. Africa stands to have whatever resources and indigenous practices it has left crushed under the same. The sad thing is that Bill Gates is celebrated as an innovator, a genius and a visionary. Kids learn fluffy stories about the rise of Microsoft and his crusade to put a computer on every desktop. Bill Gates may have succeeded in business, but that does not make him smart or even moral. He is stupidly amoral. There is a word for people like this: evil. This entry was posted in An Embattled Career, education reform, Politics, School, teaching and tagged Bill Gates, education, Famine in Africa, Genetically modified food, Monsato, News, Philanthropy as Evil, World. Bookmark the permalink. Before the establishment of his foundation as a front for his continuing wealth and power accumulation, Gates was infamous for his greed, which led to some occasional negative press reports. It was after he married his wife, Melinda, who seems to have a better nose for PR, that his foundation began. The most revealing quote by Gates I ever saw was in a ’90’s review of a book about about Microsoft, that mentioned a business meeting where he was in attendance. At one point, the meeting veered into a discussion of Microsoft’s competition in the world of print publishing, whose efforts Gates deemed inadequate. That’s just maniacal. Bill Gates did not really invent anything. He took the innovations of others and put a Microsoft label on it. He has always been, and continues to be, an exploiter.